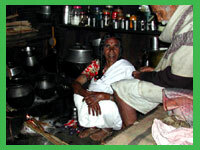 The nilgiris are the home to 18 tribal groups, amoung whom the Todas are the most remarkable. 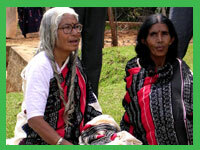 A pastoal community, the Todas are fair-skinned and curly haired, and are strict vegetarians. Their language through of dravidan origin, has no script. According to their creations myth, goddess Teikirshy and her brother on first created the baffalo by waving a magic wand, and then created the Toda man. The first Toda women was created from the right rib of the man. 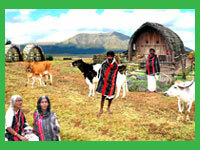 The todas first contact with civilization occured when the east India company annexed the nilgiris in 1779. In 1823, John Sullivan, the then collector of Coimbatore, built the first stone house in ooty on land purchased from the Todas. Today, there are only about 1,100 Todas left. Pale brown with long horns, are deeply reserved. 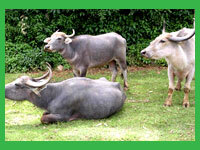 A buffalo is often sacrificed after a funeral to accompany the deceased's soul in the after life. Conical in shape, is decorated with sun, moon, serpent and buffalo head motifs. only men are allowed to go inside.. 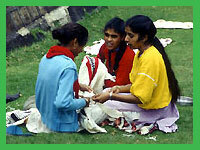 The homespun cotton shawls called puthikuzhi have black and red embroidered motifs. Worn by both Toda men and women, they are tied around the waist, with one end thrown over the shoulder, almost like a Roman toda. Elders are treated with great respect, and greeted by lifting thier right foot and putting it on one's head for their blessings. The dairy ceremonies are festive occasion's generally celeberated with dance and music. The lively songs consist of simple stanzas, describing important enents from the Todas' past. 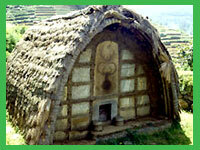 The barrel-shaped huts made of bamboo, grass and cane, consist of a small that one has to crawl through it to enter. several of these windowless bamboo huts make up a toda village, which is called a mund.